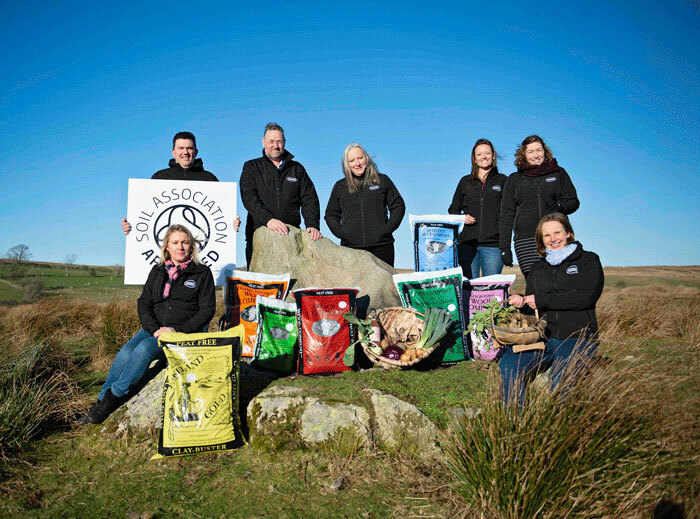 The Soil Association has officially approved Cumbrian-based Dalefoot Composts’ entire range of peat free composts for organic growing. Dalefoot Composts are made from natural sheep’s wool and sustainably-harvested bracken to feed plants for one season and beyond. The Soil Association approval makes it even easier for eco-conscious gardeners who want to ensure they are totally organic to grow their fruit, vegetables and blooms, to buy with confidence. The entire range, which includes Dalefoot’s Wool Compost for Potting & Containers, Wool Compost for Vegetables & Salads, Wool Compost Double Strength, Wool Compost Ericaceous (and Double Strength), Wool Compost for Seeds, Lakeland Gold and Bulb Compost, all now boast the Soil Association Approval Certification. Dalefoot’s premium, carbon-neutral composts all contain the must-have nutrients and trace elements in which plants can flourish. The wool comes from Dalefoot’s own flock, on the Lake District fells near Penrith, and the Herdwick ‘wool-clip’ is from neighbouring hill farmers, while bracken is harvested sustainably from the surrounding Lake District fells. By harvesting bracken on rotation, at exactly the right time of year, the ground habitat is improved for nesting birds and butterflies, in particular the endangered High Brown Fritillary. The natural water retention of the wool fibres in the compost means up to 50% less watering while high levels of natural potash from the bracken promotes flowering and fruiting, healthy growth and no need for additional plant food. The compost has a similar soft texture to peat with a wide range of naturally occurring trace elements and is made from 100% renewal resources with great environmental benefits. Jane, an environmental scientist and her husband, fifth-generation farmer Simon Bland, started making compost from the natural ingredients around their Cumbrian farm 21 years ago. They were inspired by early 20th century gardening books and their dedication to producing a totally organic and environmentally friendly product has led to the success of the company. The couple also run one of the UK’s leading peat bog restoration contractors, restoring peat lands for organisations such as Natural England, local wildlife trusts and Scottish Natural Heritage.